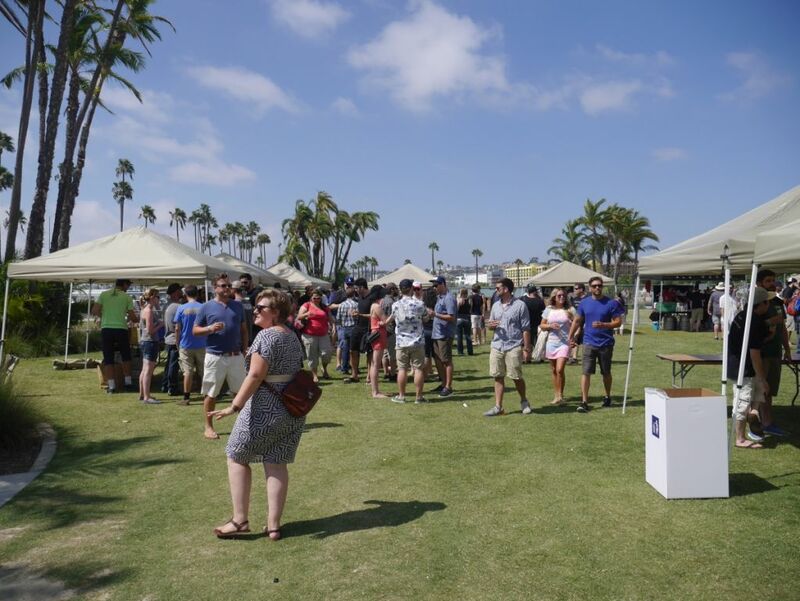 Modern Times hosted a beer festival called The Festival of Dankness on August 22, 2015 to benefit BikeSD, a charity that is dedicated to making San Diego more bike friendly. 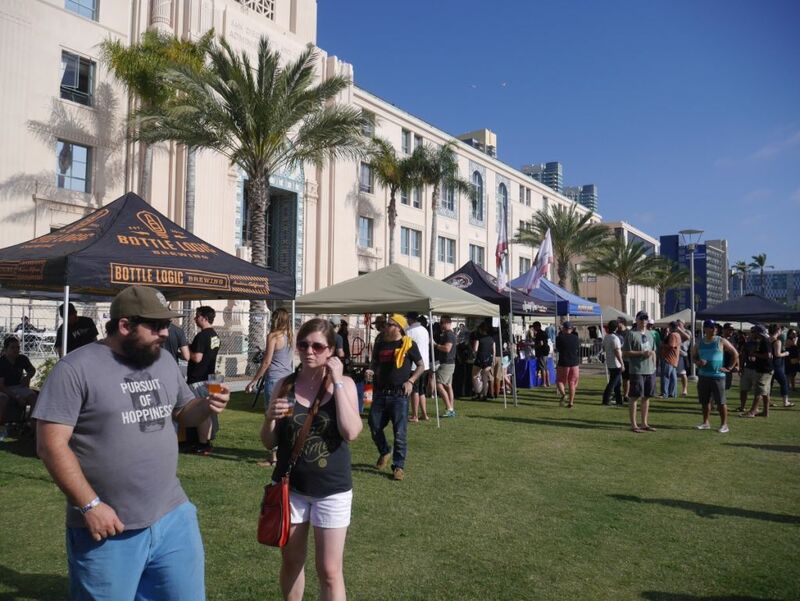 This beer festival focused primarily on hoppy beers but also had a few other styles to taste as well. To make the festival more bike friendly, the festival was held in Downtown San Diego at the new Waterfront Park that is easily accessible by bike, trolley, train, and bus. I was able to grab a ride down and take a bus most of the way home with ease. Among the breweries featured were some big name local breweries (Stone, Coronado, Rip Current, Alpine, Modern Times), some other California breweries (Monkish, Cellarmaker, Noble Ale Works, Almanac, Three Weavers, Knee Deep), and a number of out-of-state breweries (Boneyard, De Garde, Cigar City, Half Acre). Most of them brought along their best hoppy beers and a few brought along some sours or other styles. Rip Current even brought along a bock beer that was very popular as well. This was my first time attending a beer festival. 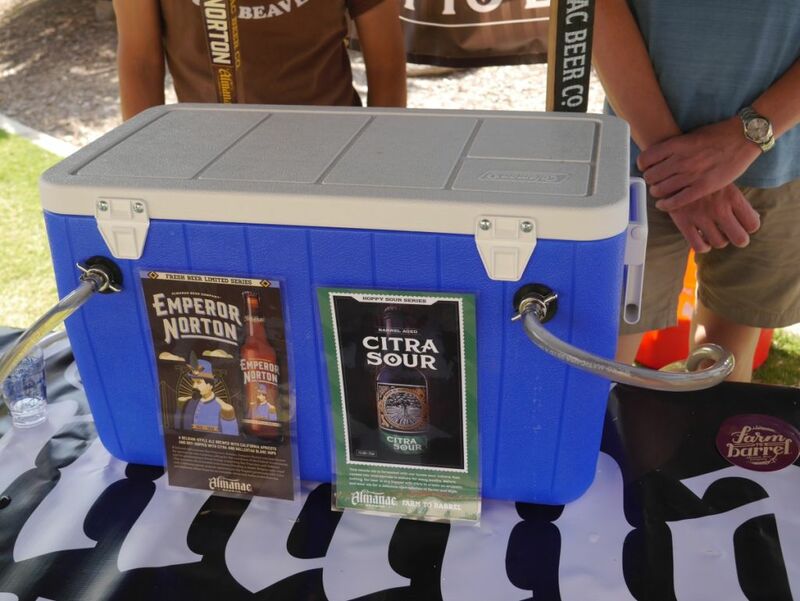 In the past I have volunteered to pour beer and enjoyed the experience but I usually don’t want to pay the money or have an easy way to get to the festival without driving. Modern Times did a great job organizing the event and everything ran smoothly. VIPs were given an extra hour before everyone else and even as a general admission ticket holder I didn’t miss out on anything because of it. I found that it was absolutely worth getting in line 40 minutes before the event started so that I could beat the crowds. It is better to leave early after trying what you want than to miss out on things and face longer lines. I left about 45 minutes early once I had what I wanted to try. I tasted a total of 37 beers (in 2 ounce tasters) so I won’t try to review everything I tried. However, I will give a rundown of some of the most impressive beers I tasted. Some were predictably awesome, like the two special beers Modern Times was pouring, Floating World (an IPA made with South African Hops) and Mega Blazing (an imperial version of the popular Blazing World) and others gave me some indication that I absolutely have to visit certain out of state breweries at one point (though visiting Almanac is not possible currently because they don’t have a tasting room). 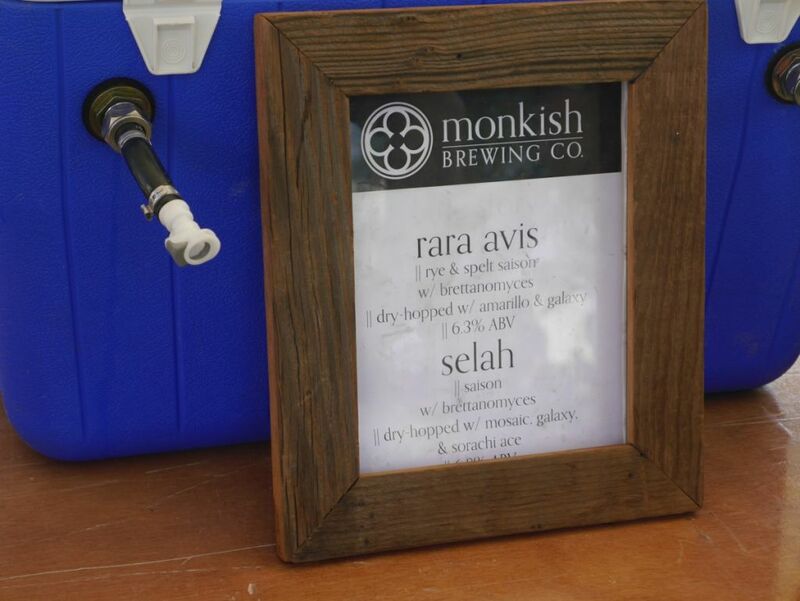 My favorite beers from the festival were the following: Modern Times Floating World and Mega Blazing, Boneyard Notorious IIIPA, De Garde Bruinette, Highland Park Raised Eyebrows, Monkish Rara Avis and Selah, Phantom Carriage Mosaic Muis, Almanac Citra Sour, Three Weavers Session IPA and Rye IPA. I was already a big fan of Monkish and it was great to try some awesome specialty brett beers that they don’t make available to the public generally. The two they brought were both delicious. Three Weavers surprised me because I hadn’t heard much about them before despite being up in LA so I will absolutely be stopping by Three Weavers the next time I am in town. They are quite close to El Segundo Brewing as well, a brewery I skipped at the festival because I had their beers before. Highland Park brewery surprised me with a complex sour from a small brewery I did not know existed. The brewery opened inside a bar up in LA called The Hermosillo. Based on what I tasted it is worth visiting them when you are in town. 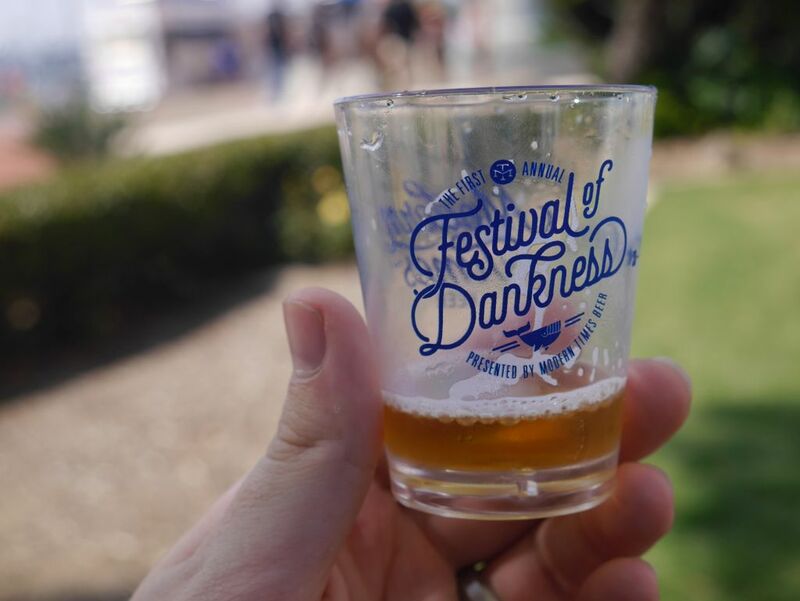 Overall I was very impressed by the selection of beers offered at the Festival of Dankness and it was a great time to be had by all, though I did leave with some minor sun burns. It was really great to be able to have so many breweries present that I wouldn’t have otherwise been able to visit very easily. I hope they will have a similar event next year. 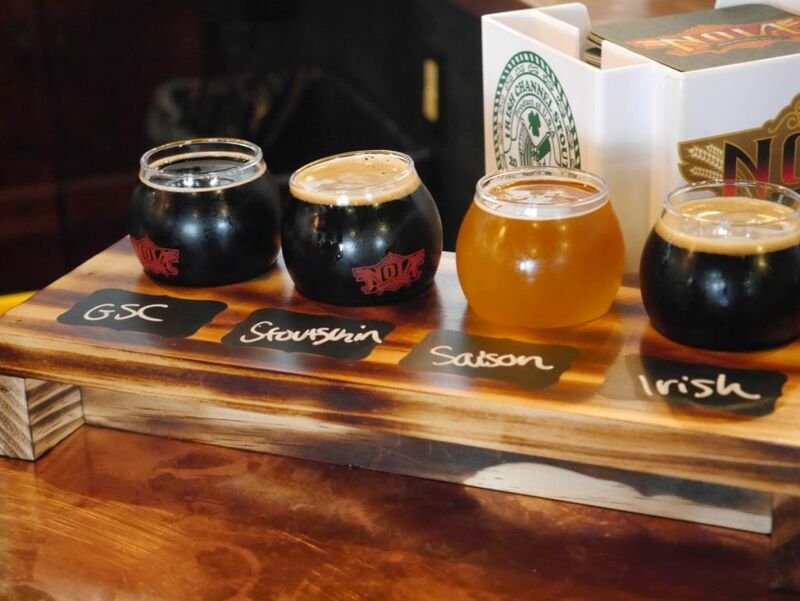 Located just a stone’s throw from Stone Brewing Company’s main location in Escondido I wondered going in how Offbeat Brewing manages to compete with the giant brewery. After tasting things it was clear that they have a very different approach to their beers, especially the hoppy ones, and they fill a completely different niche than the aggressive hoppy beers from Stone. I’ve talked to people who normally don’t like West Coast style IPAs who like the beers here. 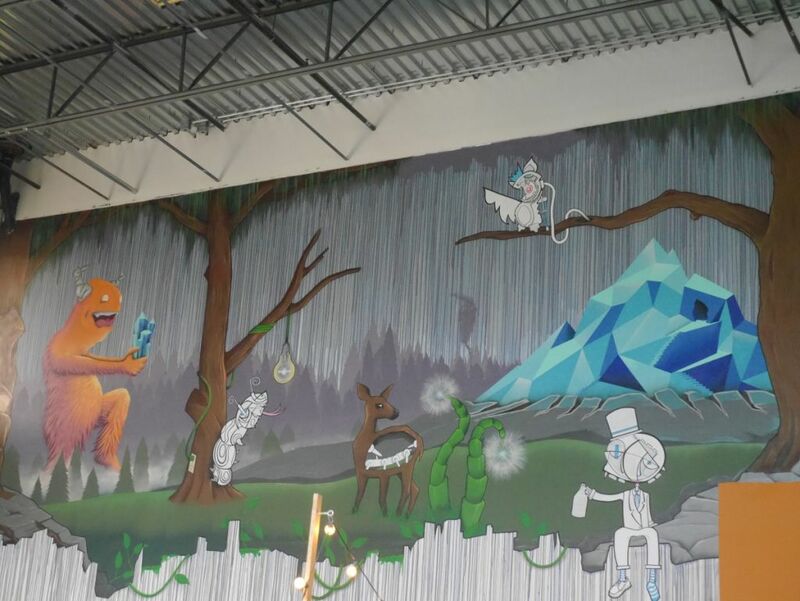 These guys are so off beat they have this bizarre yet awesome mural on the wall. Though Offbeat has been open for nearly three years they don’t have the same level of experimentation you see at other breweries. Instead they have a core set of five beers that they typically have on tap that all have a similar mellow English hop flavor going. 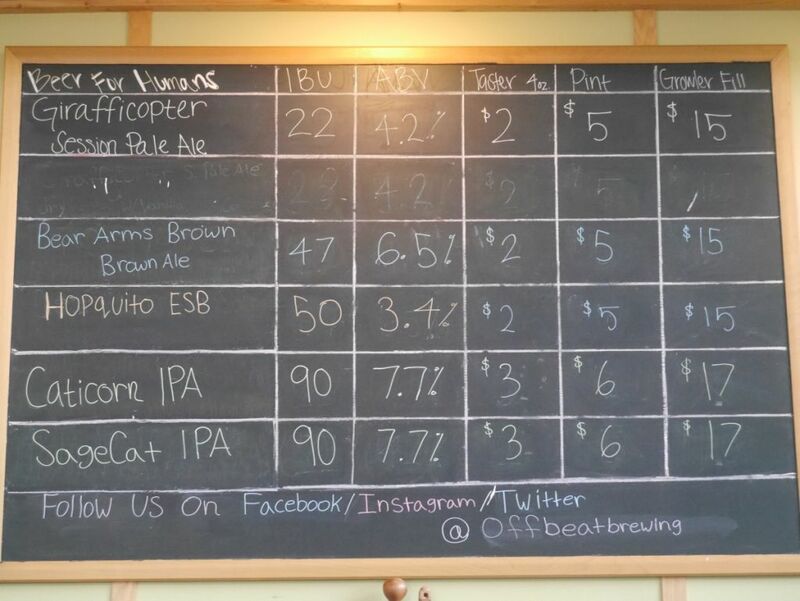 I tried the Session Pale, Brown, ESB, IPA, and Sagecat IPA while I was there. 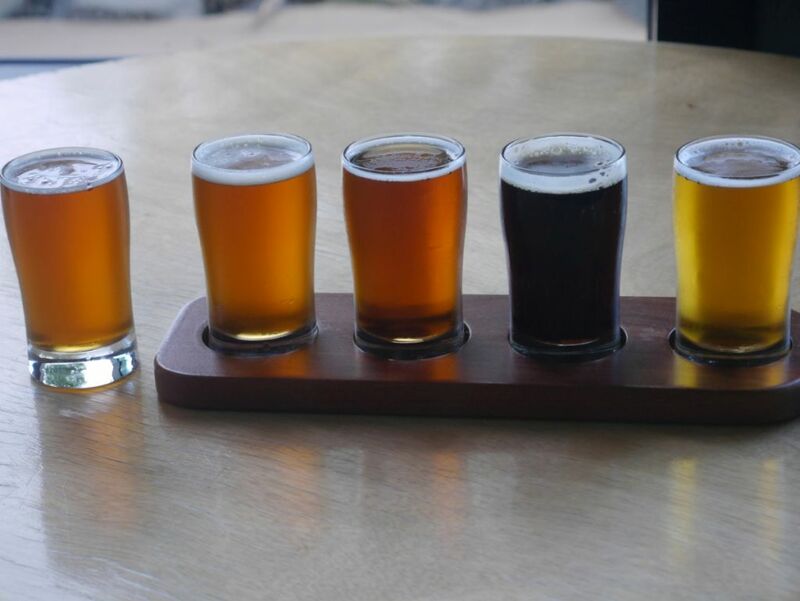 Taster flight when I visited. The Session Pale was a light golden color beer with a good fruity flavor from the hops. This is an interesting comparison to the typical bitter citrus-forward San Diego session IPAs. The brown ale was a bit more dark and roasty than the average local brown. Both color wise and flavor wise it is closer to a porter than a brown. The roast flavors are balanced nicely by some mild earthy hops. 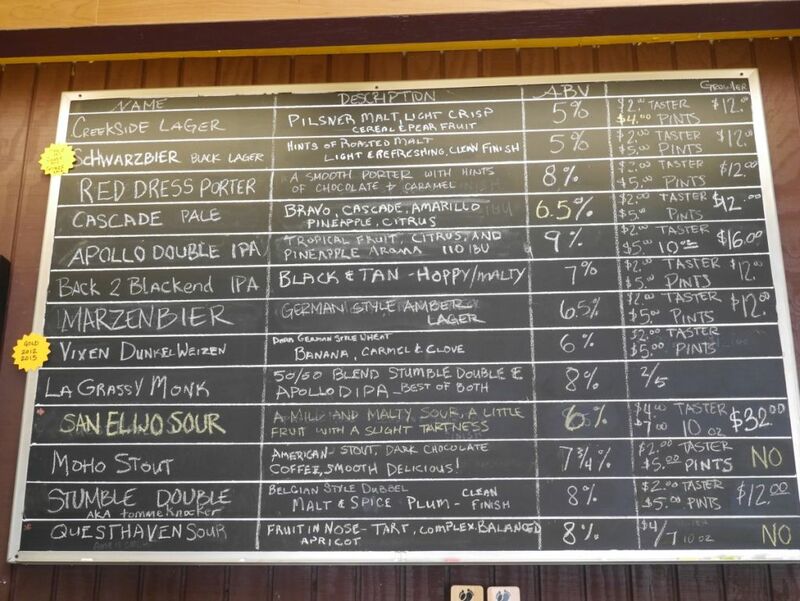 Beer list when I visited. The ESB was surprisingly flavorful for a 3.4% beer with lots of earthy and fruity flavors from the English hops. The IPA is 7.7% but isn’t very bitter and tends to be more apricot flavor with a smooth malt background. The flavors balance very nicely and there is very little of the signature west coast hop bitterness. Considering the mellow flavor, it was a perfect choice to add the peppercorns for the Sagecat IPA. Peppercorns add a nice mild spice kick and a sweetness in the aftertaste. 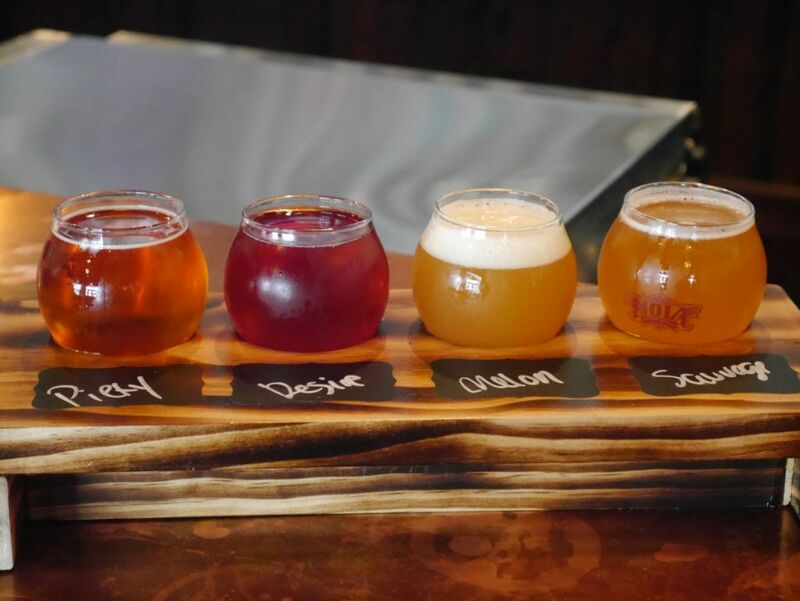 With a limited lineup and a very different selection than its neighbors it is easy to stop by Offbeat on your way to your favorite brewery in the area for a taster or two. If you haven’t yet explored the English style of IPA this is a great place to do it. 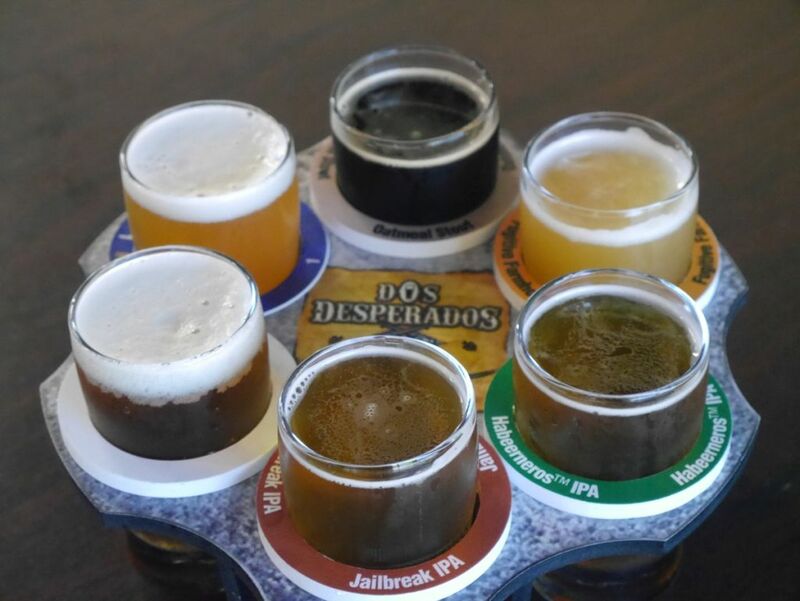 I visited Dos Desperados after Stumblefoot Brewing Company on the same day. Thankfully my husband was driving so I was able to try everything I wanted to at the time. In total I tried the Fugitive farmhouse, Outlaw oatmeal stout, Jailbreak IPA, Habeerneos IPA, Pancho Villa double IPA, Brett double IPA, and ghost pepper stout. The Fugitive farmhouse had a nice mild pepper pepper kick (hot pepper) that joins the usual saison taste. The pepper flavors balanced nice with the fruit and funk. Though it was very different from the usual saison, I quite liked it. The Outlaw oatmeal stout was a solid stout with a smooth flavor from the oatmeal. This was the only stout on the menu and it should satisfy those who don’t like hops. The Jailbreak ipa starts off with some intense bitterness and a good citrus flavor. It is a solid IPA. It is used as the background for the Habanero version. Like the Ballast Point Habanero Sculpin, this one is quite hot and really burns going down leaving a big back of throat burn. I would have a hard time having more than a taster of this. Main beer menu when I visited. The Pancho Villa double IPA is a double IPA that focuses on tropical fruit and citrus flavors with some light mango flavor. It is very hop forward and tasty, a fantastic example of a double IPA. The Brett version was also quite tasty and if I hadn’t already had a full two sets of tasters I might have ordered more of it. The brett yeast adds some nice peach flavors and gives it a cloudy look. 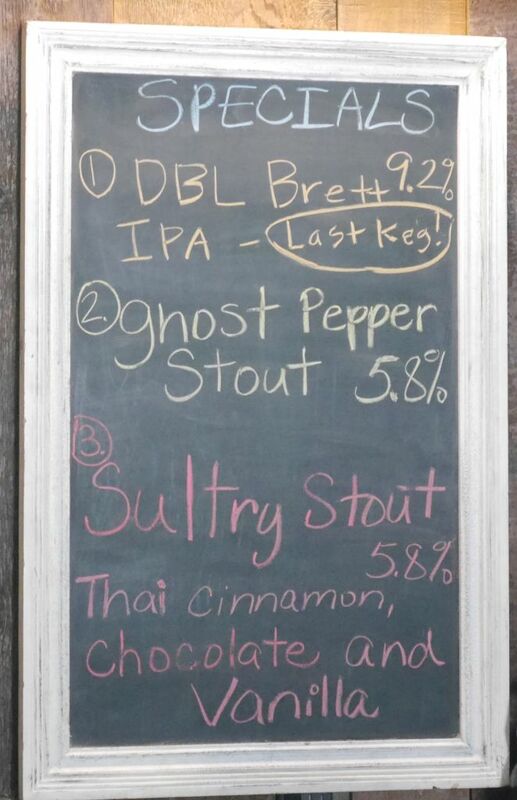 Finally, the ghost pepper stout was not as hot as the Habanero IPA. The heat hides in the background more and sneaks up on you because it is more balanced with the beer. Specialty beer menu when I visited. Overall I enjoyed what I had at Dos Desperados and liked to see the brett and other experimental beers they had on tap. The addition of spicy peppers seems to be done well like others locally though stay away if you don’t like hot. This is certainly a brewery geared more towards hops than a few of the others I tried in the area. 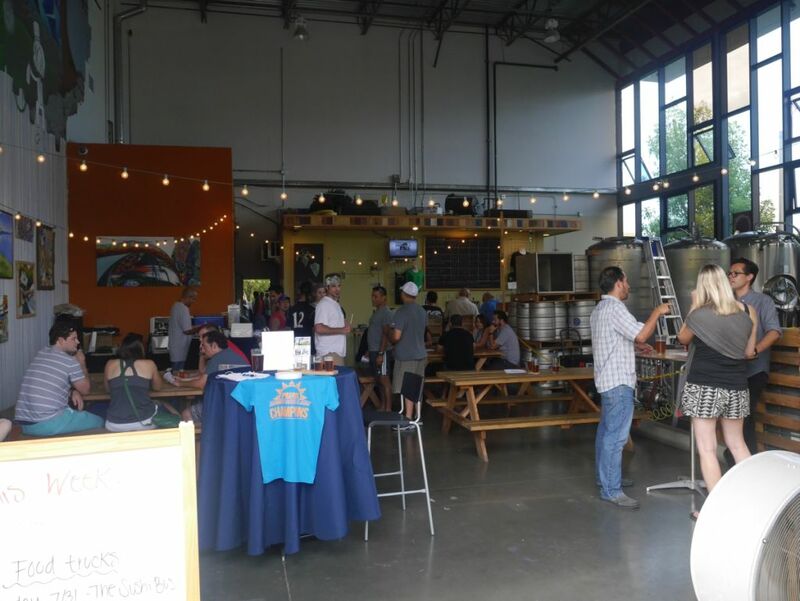 Stumblefoot looks very similar to most local small breweries at a glance. It is located in an industrial park and has a fairly bare bones interior. 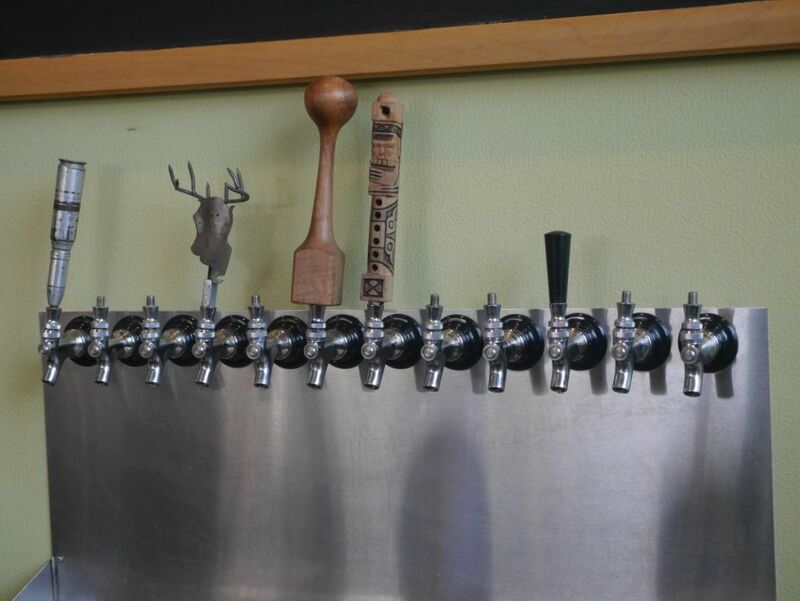 Thankfully, they have a solid lineup of beers including a few sours and a solid coffee stout. 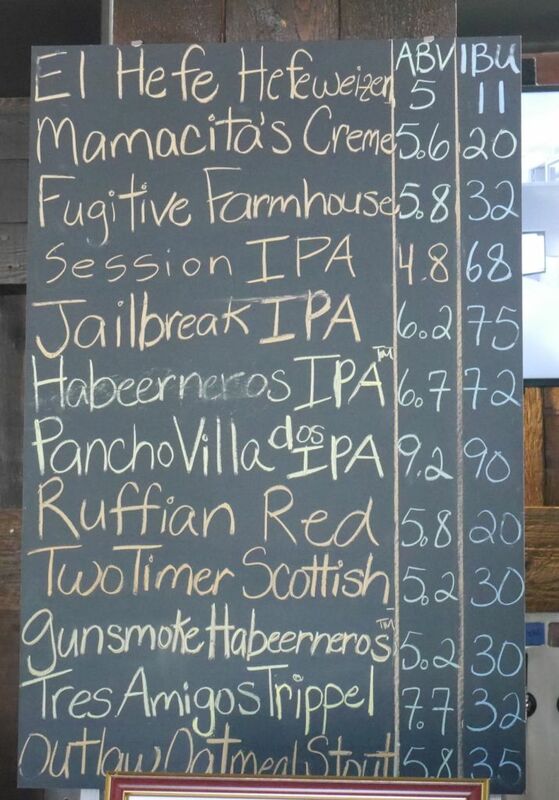 Though IPAs aren’t as impressive as others around they have a few IPA offerings as well. 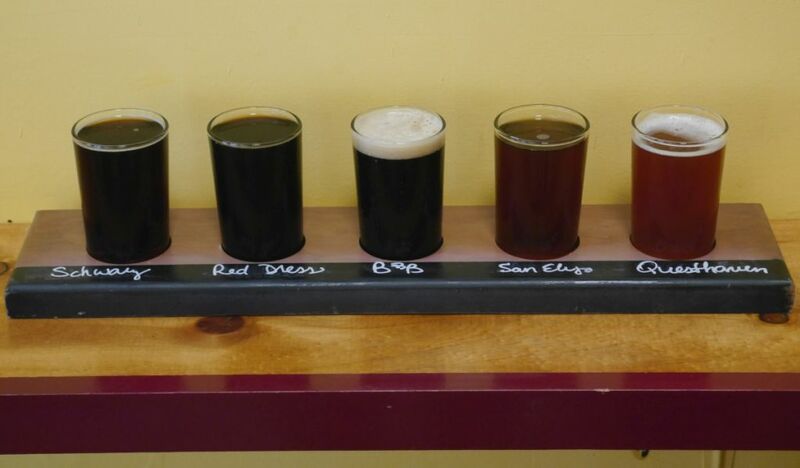 When I visited I tried their black lager (traditionally known as a schwartzbier) Red Dress porter, Back to Black IPA (a black and tan, blending the porter and the pale), San Elijo sour, Questhaven sour, Apollo double IPA, and Moho Stout. The black lager was very nice with a light body and good roasty flavors. This was the closest I have had in San Diego to the traditional ones in Prague. As it warms up it starts to taste like root beer a little. The Red Dress porter is a bit on the fruity side with a hint of cherry in the background. I didn’t taste much chocolate like they described and it was closer to a doctor pepper or cherry coke. The Back to Black IPA was solid considering it was a black and tan. You may like it more or less depending on who blends it for you. The version the server made for me at first was quite overpowering in the floral hop department. When one of the owners blended me one later it was a bit more balanced and tasty. It should satisfy anyone who is looking for a black IPA. Tasting board when I visited. Both of the sours were quite nice. The San Elijo sour would make a great introduction to sours and the brewer described it as such. It is mostly malt forward with a fruit background. Though nice I preferred the Questhaven sour, a barrel aged variety that has some strong apricot flavor that blends nicely with the oak flavors. I almost picked up a bottle before leaving. The Apollo double IPA was a solid double with a good combination of floral, citrus, and tropical fruits. It didn’t wow me but it should satisfy hop heads who visit this place. I ended with the Moho stout, which was a bit more traditional than the Red Dress porter. The flavors presented a nice mix of coffee and chocolate with plenty of roast on the back end. I was most impressed by the sours here, though they seem to be doing an all-around solid job with the beers. This place is also dog friendly and we had no problem coming by with a friend’s dog we were taking care of at the time. I liked having an alternative style of sour here compared to Toolbox that didn’t do as much with the fruit flavors. 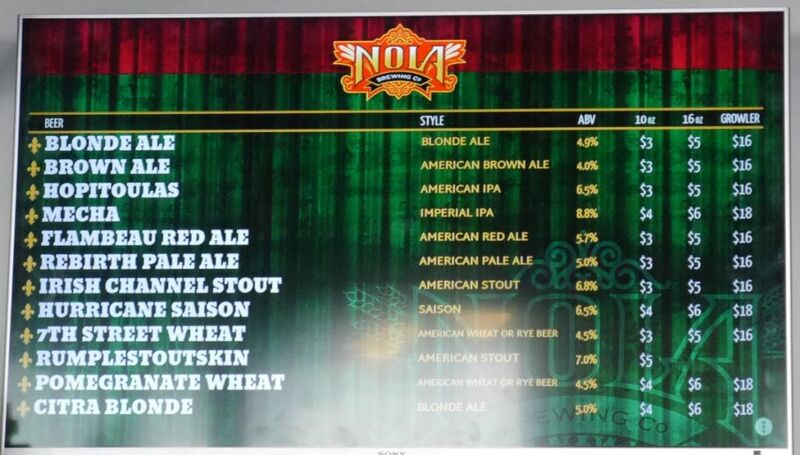 When I was in New Orleans, I almost didn’t stop by NOLA brewing because I figured it was going to be a lot of the same ambers and English style IPAs that I saw in many of the bars from them. When I had a little extra time to kill I decided to go anyway and lo and behold there were two sours and two brett beers on the menu along with a delicious saison and a variety of stouts. I didn’t have a chance to try their IPAs while I was there but with so many beers on tap I would have barely been able to walk out if I had. 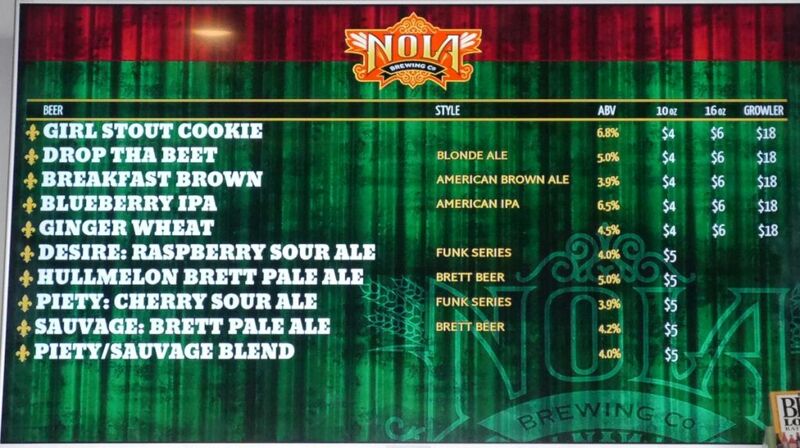 In total I tried the Piety cherry sour, Desire raspberry sour, Hullmelon brett pale, Sauvage brett pale, Girl Stout Cookie, Rumple Stout Skin American stout, Irish Channel stout, and Hurricane saison. My husband drank most of the stout tasters but I had enough of each so that I could taste them. The Piety cherry sour was very smooth with a medium amount of sour and a light cherry flavor that balances nicely with the rest. It poured a nice light amber color almost orange. Considering many cherry sours get to be a little much for me, I liked this one. The Desire raspberry sour was a satisfying sour with plenty of raspberry flavor, medium amount of funk and medium amount of sour. This was my favorite of the two sours. Brett and sour beer taster flight. The Hullmenlon brett pale poured a cloudy yellow and presented a nice melon and citrus flavor. This beer was very smooth and tasty. The Sauvage brett pale seems to be a beer that they make with various hops depending on the batch. The one on tap tasted like it used nelson hops and another one available in bottles was brewed with galaxy hops. The beer had a nice intense grapefruit flavor and a solid bitterness that balanced very nicely with the brett funk in the background. The Hurricane saison was bright and fruity with some intense tangerine and peach. The fruits went nicely with the saison yeast flavor. This was a very impressive saison. The Girl Stout Cookie seemed to be a thin mint style stout. It had a nice minty flavor and some mild chocolate, making for a solid stout. I don’t normally like mint in my stouts but it was subtle enough that it worked well. The Rumple Stout Skin American stout was a bit on the fruity side with some cherry flavors that balanced with some strong bitterness from some hops. Comparatively, the Irish Channel stout was a bit more chocolate forward and less bitter. I preferred the Irish Channel because it was a little more smooth and typical of the style. This one is also available around New Orleans in cans. Before I left I also got to taste some of the Sauvage with galaxy hops thanks to someone next to me at the bar. He enjoyed the flavors of the one on tap and was curious to see how the galaxy would taste. He poured me a small taster and it was tasty but the galaxy had faded, leaving a more traditional brett pale taste. 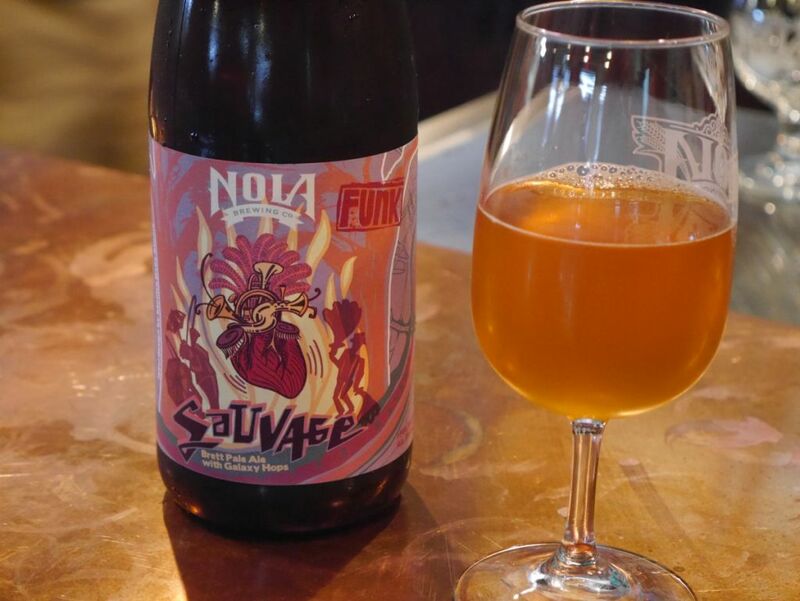 Depending on your hop preference, it may be better to enjoy the Sauvage on tap. 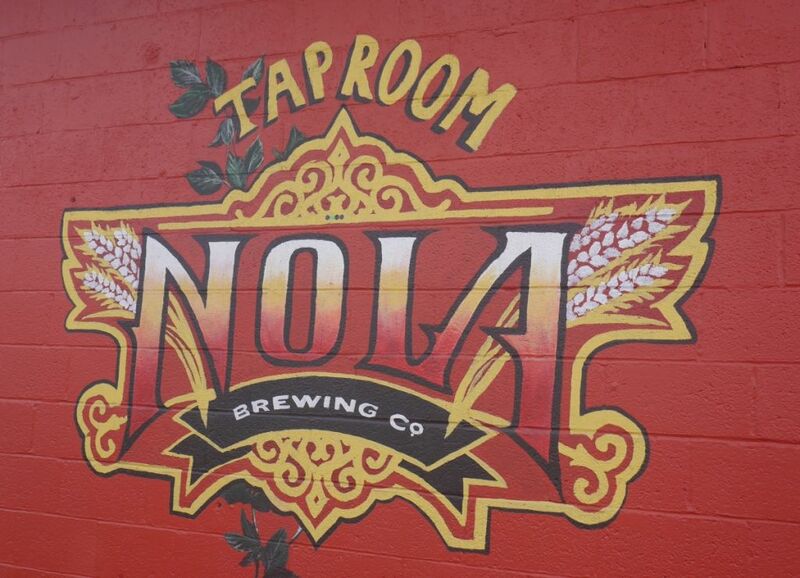 If you like sours or brett beers and are in New Orleans you absolutely need to stop by NOLA brewing for some tasters. They also have plenty of more traditional options on the menu as well. Thankfully they are situated in a part of town where it is easy to park because most of downtown New Orleans is a nightmare with parking.